At the end of our jerky truck ride, we got to get out, stretch our legs a bit and I spotted this fellow who was selling coconuts or ye-tze. I ended up limiting my ramble-on-rocks ability by buying a few, so my cousin could try his first coconut juice-from-the-coconut, and I ended up with hand and arms full of the large bouncy things. Coconuts bounce. When I had my first coconut juice directly from a coconut, it was in Danshuei. I think it was after my uncle’s funeral in a brief visit I had. My (then-little) cousins and I got coconuts to sip from with straws next to the river, and I was amazed that inside this big green melon was that little brown furry ball I saw at the supermarket labeled as coconut. I was never fond of coconut shavings or coconut in chocolate. However, I liked the sweet clear juice slipping down my throat, and the coconuts were fun to try to break, but bounced, not quite as well as a basketball (which didn’t prevent my attempts to dribble), but quite satisfactorily bounced on the cement sidewalks. 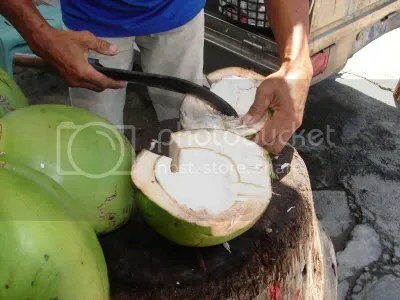 So, we sipped our coconuts dry through plastic white straws, and then my mother led me back to the grand coconut man, who obligingly sliced through our coconuts and carved the white meat out for us. The white meat is where the coconut shavings come from, and it’s actually pretty tasteless next to the actual coconut juice. It’s a very crisp texture. I still prefer the juice. 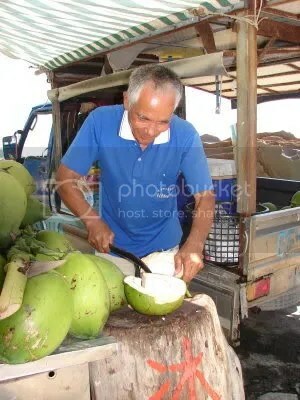 The grand coconut man wielding his curved knife expertly, and precisely to get the meat out for us. When he was halving the coconut and chopping out the squared hole for our straws, it was more like hacking with that scythe, but getting the meat out he showed a deft grace.